Shiitake mushrooms are one of the most widely cultivated mushrooms in the world when it comes to both personal and commercial growing. This is no surprise considering shiitakes are among the most palatable mushrooms. In commercial cultivation, shiitakes are typically grown on hardwood logs, and this causes them to impart a woody flavor into meals. They have a meaty texture that offers vegetarians a sound alternative to meat. The shiitake knows no culinary bounds, but they’re most frequently incorporated into soups, stir fries, sushi rolls and even pasta dishes. Originally, shiitake mushrooms were seen primarily in Asian cuisines, but this mushroom is “growing” in popularity around the world. Most suppermarkets carry fresh shiitakes, but they also can be dried. The demand for shiitake mushrooms in restaurants has led some amateur mycologists to cash in on their hobby by supplying fresh homegrown mushrooms to restaurants or to sell at farmer’s markets. In additional to being one of the most popular culinary mushrooms, Shiitakes have traditionally been valued as a top medicinal mushroom. Several research studies have indicated that so-called mycochemicals in shiitake mushrooms can inhibit tumor growth. 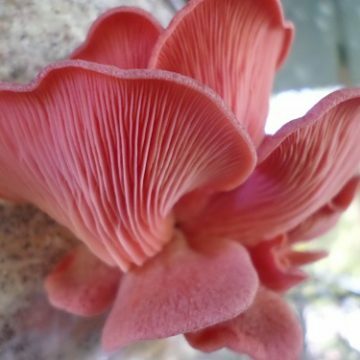 Lentinan, a polysaccride, is one such mycochemical that is produced in shiitake mushrooms that has shown anti-cancer and general tumor-inhibiting abilities that surpass those of other mycochemicals with anti-cancer potential. That suggests that the shiitake is perhaps the most importnat mushroom when it comes to anti-cancer support. Lentinan has actually been isolated and sold as a pharmaceutical drug for the treatment of gastric cancer. Lentinan does not kill cancer cells directly, but it upregulates the immune system. Lentinan is also used in treating HIV. Shiitakes are also a rich source of selenium, which is a potent anti-oxidant that may also offer anti-cancer support. Aside from anti-cancer support, shiitake mushrooms are beneficial to the liver and kidneys. Shiitake mushrooms also support heart health by regulating blood pressure, reducing cholesterol and potentially aiding in stress reduction. Shiitake mushrooms may also benefit diabetics by helping regulate blood sugar. In addition to all of these benefits, shiitake mushrooms are said to have anti-bacterial properties and are beneficial to immune support. Only reishi and cordyceps mushrooms have a similar range of potential health benefits as the shiitake mushroom, but none of them combine the culinary appeal that shiitakes offer. All-in-all, you might say that shiitake mushrooms are the most useful mushrooms you can grow. Shiitake mushrooms grow best on hardwoods. Logs inoculated with dowel spawn are the traditional method for growing. 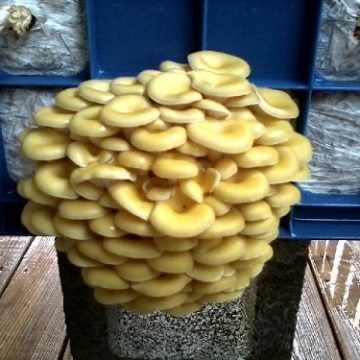 However, shiitakes are commonly grown at home on sawdust blocks, as you can see in our photos. 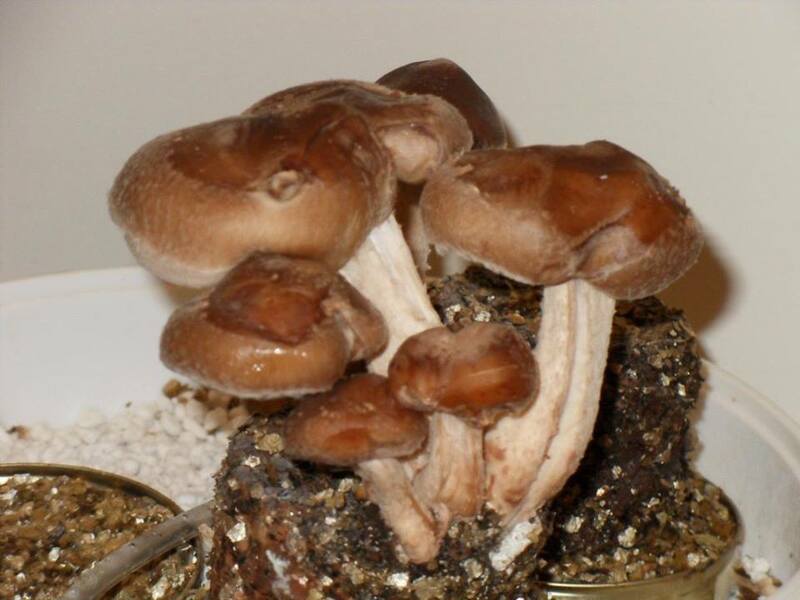 Shiitake mushrooms are moderately easy to grow at home. You can learn step-by-step techniques for growing shiitakes by watching the Let’s Grow Mushrooms video. 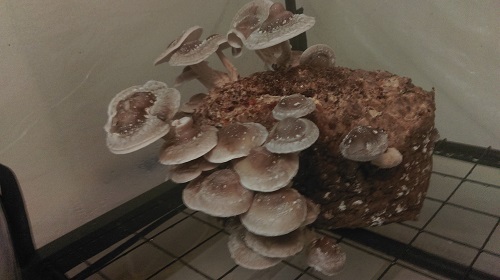 We have also experimented with growing shiitakes using a modification of the so-called PF Tek, which would allow novice growers to grow their own shiitake mushrooms at home. The PF Tek is a common method for beginning growers that reduces the risk of contamination by limiting the exposure of the substrate to air before it is completely colonized. The Pf tek accomplishes this by sterilizing the mushroom substrate inside canning jars and inoculating it inside the jar. The mushroom substrate is inoculated by a sterilized syringe, so that the substrate never touches the air until it is fully colonized. Upon full colonization of the mushroom substrate, there is much less risk of contamination by molds or bacteria. 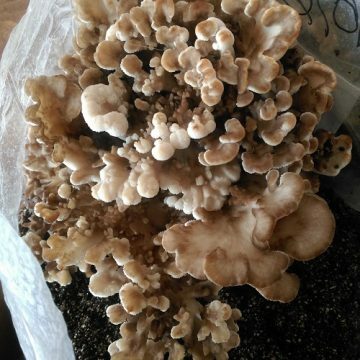 Whereas the standard PF tek calls for using brown rice flower, we were able to produce fruiting shiitake mushrooms on cakes of powdered wild bird seed and vermiculite using the same ratios. 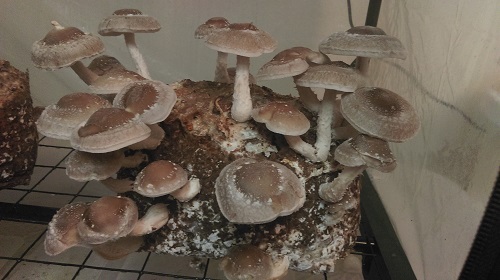 The third shiitake image in our gallery is an example of shiitake mushrooms fruiting on these PF cakes. 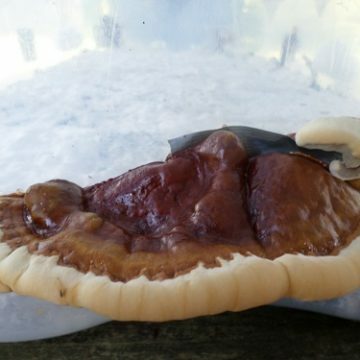 There is also a more effective variation of the PF Tek for shiitake mushrooms that uses sawdust supplemented with wheat bran and gypsum instead. This is essentially the same type of substrate from which shiitake growing blocks are produced. 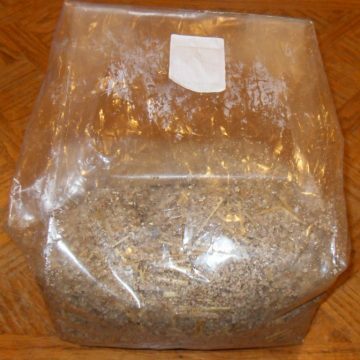 You should get better results with the supplemented sawdust, but the powdered bird seed may be easier to obtain and simpler for first-time growers. Each item contains one petri dish with a shiitake mushroom culture culture colonized on MEA substrate. This culture of shiitake seems to perform well on a wide range of substrate mixes.